When gas charging in an air conditioning unit the correct procedure should prevent the system from leaking again. All split systems have 2 main connection points which are joined using a flaring tool when the air conditioner is installed. The pipe connections if not flared properly or tightened to the correct torque may leak, which is the most common cause as to why an air conditioner needs to be re-gassed. If a system has been installed for a long period of time (over 6 years) the copper piping used in the installation can develop tiny holes, cracks from vibration that can allow the refrigerant to leak and eventually lose all of the refrigerant. Ac Maintenance Dubai may just top up the system with gas, this is not the correct procedure if there is no gas in the air conditioner. Only if the system is close to the correct temperature/pressure a refrigerant adjustment maybe possible. The correct way for gas top up in an air conditioning system is that the refrigerant must be weighed inn, in accordance to the air conditioner manufacture. This is displayed on the sticker on the outdoor condenser unit, this refrigerant maybe R22, R410A or R32 which are the most common refrigerants in air conditioning. We carry a 6 month warranty on new installation of an Air Conditioner in Dubai for any refrigerant leaks, any second hand air conditioner does not carry a warranty. Other various issues may arise with air conditioners over a few years old, which may cause refrigerant leaks because of the vibration within in the system which is separate from the actual pipe connections from installation. Recover any refrigerant or air in the system if required Air Conditioning Gas Top Up. Cut off old flares and re-flare new. Re-connect both ends using a lube behind the flares. Nitrogen charge unit pressure test if required. 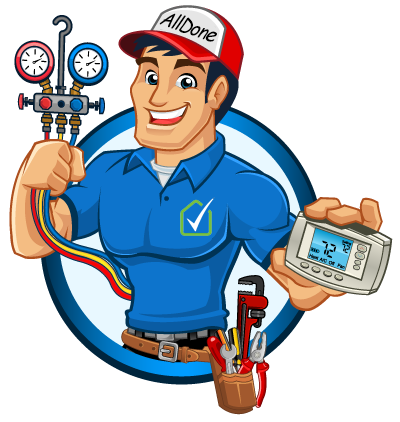 Rest assured, All Done AC Maintenance Co. LLC have an expert team of qualified professionals to assist with all general air conditioning maintenance procedures relating to your Ac system. Here at All Done, our helpful tradesmen are experienced in both new and old AC unit’s. A poorly installed or maintained Air Conditioning system will not provide a quality heating and cooling service in Dubai. As a customer service focused company, we can ensure you are provided with the necessary information and end-to-end service you and your air conditioning system requires. Our aim is to maintain & sustain your Air Conditioning system for the long term. Contact us on (052) 297 7603 or alldonetech@gmail.com to learn what preventative tactics you can use to ensure the longevity of your air conditioning system in Dubai. All Done Air Conditioning understand our service is not a one time occurrence. If it’s your older air conditioning system needing repair? Perhaps your new air conditioning unit is not cooperating the way you want it to? We are happy to answer your calls and come out and help fix your AC unit. Any concerns or issues dealing with air conditioner maintenance and repair can easily be rectified. Our customer service professionals are happy to help by explaining how your A/C system works and what you need to do maintain its quality. Air conditioner units in Dubai typically last anywhere between 5-8 years. As experts in the field we recommend a 1-2 yearly routine check up to improve the lifespan of your Air Conditioning unit to up to 5 extra years. Our process is quick, efficient and will not incur any distractions to your domestic or commercial space. All Done Air Conditioning puts customer satisfaction first by understanding what our clients are looking for in tradesmen. All Done Air Conditioning are your team of professionals for all your air conditioner repair and servicing in Dubai. Contact us on (050) 297 7603 or alldonetech@gmail.com for call out assistance or over the phone advice.